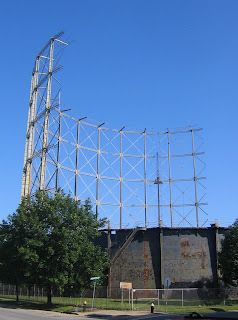 In January, I posted about the impending demolition of the Laclede Gasometer at Chouteau & Newstead. For several months I wondered why nothing seemed to be happening, but I happened to be passing through FPSE last week and saw that it is finally being dismantled. Just east of the Gasometer across Newstead stands a 2-story brick building on the corner of a mostly vacant block. The building is owned by Forest West Properties, who last year demolished several other buildings on the block. 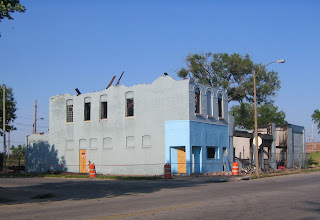 It appears that the corner building recently burned, and is currently being demolished as well. The building to the east under demolition is owned by Forest West Properties, the real estate arm of Washington University School of Medicine. Unfortunately, Forest West seems to have never owned a building in Forest Park Southeast that it would not consider demolishing. 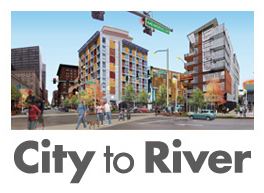 Forest West demolished 22 buildings en masse last year. i'm sure that was an accidental fire! 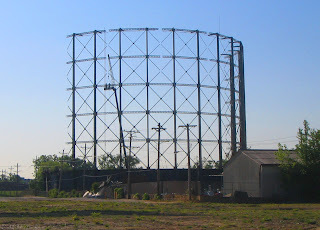 The city actually owns the building and land just east of the gasometer.